Fluorinated compounds have unique properties, and their synthesis was a major technological advance of the twentieth century in the field of organic chemistry. The introduction of the C-F bond in organic compounds has led to the development of new compounds with a wide range of industrial applications. However, such advances also led to the introduction into the environment of previously non-existent molecules with which ecosystems have to cope in order to maintain their equilibrium. Conventional wastewater treatment plants are not equipped to remove many of such compounds, and occurrence from diffuse pollution is difficult to tackle. Since microorganisms are the major decomposers of organic matter in ecosystems, it is important to understand the capabilities they possess to deal with these new entities – what do we know about the biodegradation of these molecules? What resources exist to enhance the biological processes of degradation of these molecules and to mitigate the potential harmful effects that these compounds can exert on the environment and health? Taking as starting point the synthesis of ​​fluorinated compounds, with applications ranging from agrochemicals to the pharmaceutical industry, and their introduction into the environment, this session intends to present the potential of microorganisms to degrade these molecules and how these molecules may affect wastewater treatment, emphasizing the applicability of some biological technologies for attenuating its accumulation and persistence in the environment. 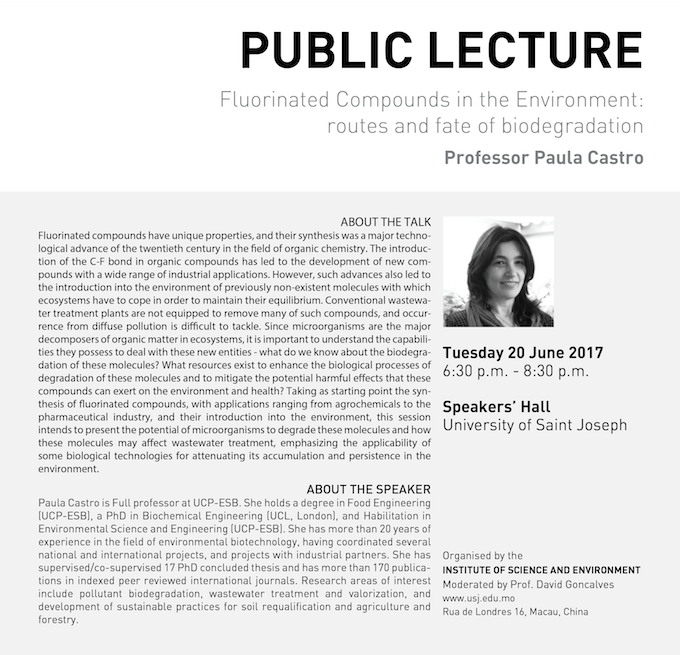 Paula Castro is Full professor at UCP-ESB. She holds a degree in Food Engineering (UCP-ESB), a PhD in Biochemical Engineering (UCL, London), and Habilitation in Environmental Science and Engineering (UCP-ESB). She has more than 20 years of experience in the field of environmental biotechnology, having coordinated several national and international projects, and projects with industrial partners. She has supervised/co-supervised 17 PhD concluded thesis and has more than 170 publications in indexed peer reviewed international journals. Research areas of interest include pollutant biodegradation, wastewater treatment and valorization, and development of sustainable practices for soil requalification and agriculture and forestry.